The trimmer head on a Weedeater featherlite will sometimes stop rotating because the rotating mechanism has siezed. When this occurs the starter cord will resist and prevent you from starting the engine. If this occurs when the engine is already running the trimmer head will start to smoke when you apply throttle. However this does not mean the end for your weedeater! 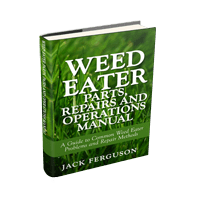 The rotating mechanism can easily be repaired to allow you to wack those weeds for many more years to come. 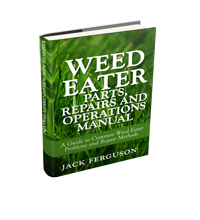 This step by step guide is only suitable for curved shaft weedeaters. However the same principle applies for straight shaft weedeaters. Using your hand check the rotation of the trimmer head. If it does not rotate without excessive force then you have a problem. Also when you try to pull the starter cable it will simple resist and not spool out. Remove the trimmer / cutting head. Remove the bushing assembly on the end of the curved shaft with the careful aid of a hammer or block of wood. Pull apart the bushing assembly to access the bush. You should find that the deterioration of the washer inside the bushing assembly is seizing the bush preventing rotation. Clean up all the bushing assembly parts and apply multi-purpose grease. Put all the bushing assembly parts back together in reverse order. Refit the bushing assembly to the end of the curved shaft ensuring that you align the assembly correctly with the shaft. Do not use excessive force. Need a New Trimmer Head or Parts?